Backup iPhone or iPad through iCloud is quite convenient indeed, but iCloud backup slow speed takes you at least one hour to backup 1GB data if you have a 2 Mbps network connection. iCloud backup taking forever, days or hours issue not just costs you much time, but also means that you can't restore iPhone/iPad from iCloud backup promptly. 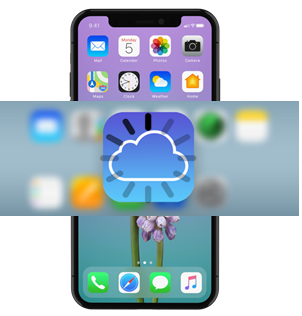 So, no matter you want to save your important data or transfer old data to a new iPhone handset, you should learn how to speed up iCloud backup. How to Solve iCloud Backup Taking Forever? 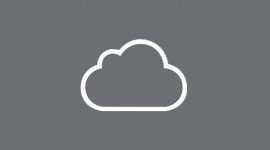 ✔ Say goodbye to iCloud backup taking forever, days, hours. Support iOS 12 iPhone Xs/Xs Max/XR. How Long Does iCloud Backup Take? These are just three samples to show how iCloud backup taking forever, days or hours annoys people, and you can also find more about iCloud backup taking long issues on other platforms. To tell you this truth is not our final purpose, but to offer you a solution is. So, go on reading to find why and workarounds to iCloud backup slow issue. Why Does iCloud Backup Taking Forever, Days or Hours Happen? iCloud backup is slow because there are too many files needing to sync, including app data, call logs, visual voicemail, ringtones, notification settings, purchases, photos, videos, music, messages, screen display, HomeKit data, etc especially on the 512GB iPhone XS Max. 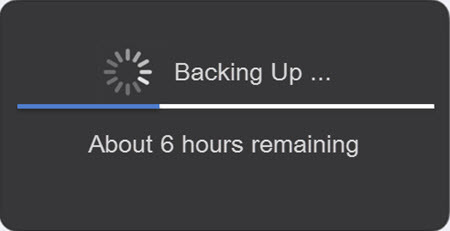 If you hadn't backed up iPhone via iCloud, there must be gigabytes of data needing much time to backup. Besides the large file size, another main reason causing iCloud backup taking forever, days or hours is the poor WiFi connection. iCloud backup is only available under the WiFi condition, so make sure that there is such network and it is strong as well. Sometimes, iCloud backup taking forever also happens causing iCloud backup could not be completed problem because of no enough iCloud storage space. You can upgrade your plan to gain more iCloud storage space, or find an alternative way if you do not want to sacrifice your pocket. How to Solve iCloud Backup Taking Forever or Speed up iCloud Backup? Method 1. From official support, Apple suggests you to turn on iCloud backup and allows for automatic backup at night to make sure that your iCloud backup is processing every day to reduce the backup time. Of course, please assure that it happens under WiFi condition and there is enough iCloud storage space. Method 2. From what we have mentioned above, the file size is another important factor that causes iCloud backup taking days hours long. Before iCloud backup, you can disable some large files, turn off useless backup, clean the cookies in the Safari browser or cache from apps and delete useless photos, music or videos that occupy much space. This way helps a lot, but I guess you would not be willing to remove any important data to just solve the annoying iCloud backup slow issue. So, maybe you can try method three. No matter how you increase the WiFi speed, you will find that iCloud backup is not that competent to finish the whole backup task in minutes. Worse still, you have to upgrade the iCloud storage plan when your iPhone data is increasing as time goes on. To speed up iCloud backup without losing data or sacrificing your pocket, we suggest you to try DearMob iPhone Manager to avoid iCloud backup taking forever, days, hours problem once for all. DearMob iPhone Manager is as of now the best iPhone backup software with military-level encryption method that can replace iCloud and iTunes. You are allowed to one-click backup the whole iPhone XS Max/XS/XR to computer or selectively sync photos, videos, music, etc one by one or in bulk to computer at will. With this iOS backup software, a 16GB iPhone with about 14GB data files can be backed up to computer within 20 minutes easily. If you need more management on your iPhone iPad data like transfer photos, make ringtones, export contacts, etc, DearMob iPhone Manager could also offer help. How to Solve iCloud Backup Slow Error via DearMob iPhone Manager? Step 1. Click the download button above to download, install DearMob iPhone Manager on your computer and launch it. Step 2. USB-connect your iPhone to Mac/PC, then this iOS backup software tool will automatically detect your device. If this is your first time to connect your iPhone to computer, there would be message popping up on your iPhone and you should tap "Trust This Computer" to continue. Step 3. Click "Backup" button to backup iPhone in minutes. When you access the backup window, you can see three options. 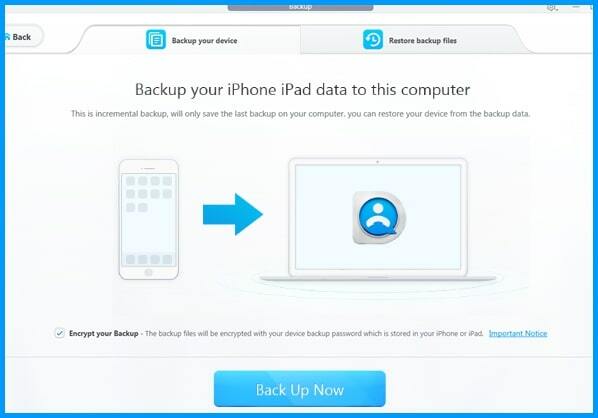 Backup Now part allows you to transfer everything from iPhone to computer, and Restore part can restore iPhone without iTunes: the data you backed up in advance. If you need to encrypt your data, just check the 'Encrypt your Backup' icon. Step 4. Just click "Backup Now" to backup all data from iPhone to computer. No more worries about iCloud backup taking forever, days or hours issue now. Why we didn't recommend you iTunes to replace iCloud to Solve iCloud backup taking forever, days or hours problem? Besides backup and encrypt iPhone like iTunes, DearMob iPhone Manager outshines iTunes regarding the fast speed and no buffering. Besides, you could backup data from multiple accounts to one computer at will plus a selective iPhone data backup choice. How to Solve iCloud for Windows 10 not Working Problem? How to Download & Use iCloud Photo Stream on PC Windows 10?